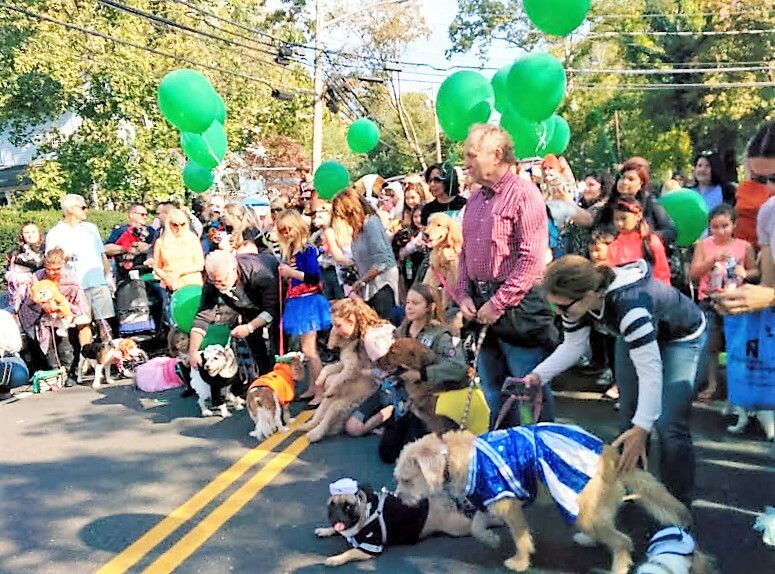 Dogs Luv Us and We Luv Them: I Love A Dog Parade! 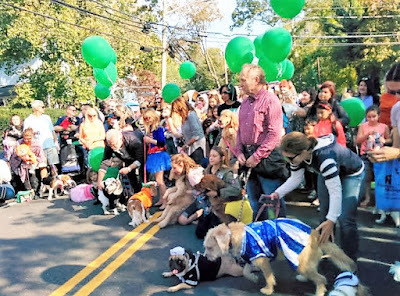 I Love A Dog Parade! 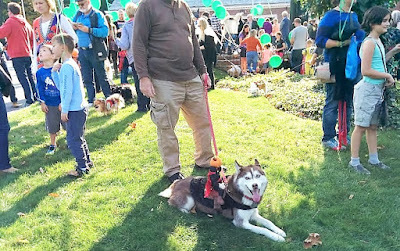 In the small town of Cold Spring Harbor, Long Island we took Icy to the annual doggie parade. I love pet festivals, pet parades, and in fact pet events of all kinds, but especially dog events! The Halloween Dog Costume Parade was such a fun event! I was surprised that they actually closed Main Street to allow pooches and their humans to parade down the street. It's always so much fun to see pets in costumes. Here are some highlights from the parade. Everyone gathered on a corner, near the Long Island Sound inlet. Icy was ready & waiting to parade! Wearing her Headless Horseman costume, Icy patiently waiting for her chance to strut her stuff! 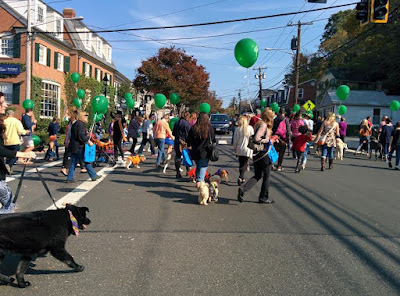 Finally the parade began and the crowd of dogs & their humans started strutting their stuff down Main Street. So many cute dogs, it was total CUTENESS OVERLOAD!! Proud owners showed off their adorable dogs of all shapes & sizes. Not sure what this costume was but it's so cute! Transformers maybe? Aww, how pretty does this girl look in PINK!? 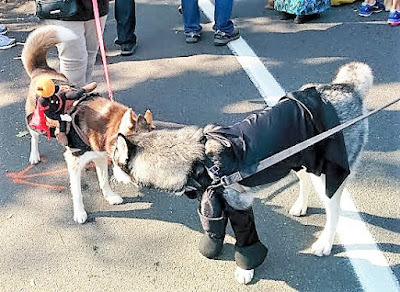 Icy ran into a fellow Husky and doggie day camp playmate, Ghost. I swear he's the mellowest Husky I've ever known! I'm so jealous. Hey Ghost! 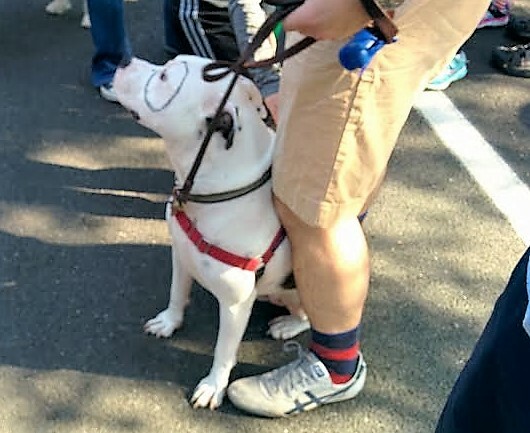 Lookin' good, it's great to see you parading, see you in PetSmart doggie day camp! 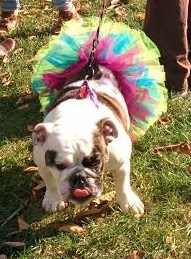 Aww, a Bulldog in a Tutu, what could be more fetching!? Hey look! It's Petey from the Little Rascals, LOL! This Pittie was such a sweatheart! Posing for a photo op at the end of the parade. Icy didn't make it into the shot, she was too busy yapping with some doggie friends on the side! It was a wonderful time, see ya next year everyone! Have you ever paraded with your dogs? Tell us about it in the comments, we love hearing from you!! What a fun day! I love dog parades too. 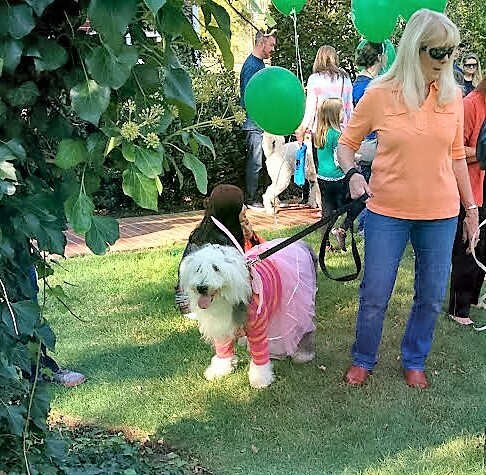 We have an annual Barkus & Meoux Mardi Paw parade each year. Oh that must be SO awesome! I think one of the scenes in your book The Returns - Showpstoppers sounds like it was inspired by that paw parade - am I right!? Aww, thank you Ruby! That Sheepdog was just gorgeous and such a sweetie - I wish I had gotten a better photo of her. She was so happy, it was a really fun time. Oh my gosh, how sweet! We love to visit small towns - they have the most enjoyable character and the people (and pets) are so friendly. Love the little gingerbread pup, too cute! This town is adorable. It's so small & quaint and has lots of beautiful architecture & some whaling history. But don't let the quaintness fool you - it is a very wealthy town! Magic isn't into costumes but I sure enjoy seeing the pics. Looks like everyone had a blast! Not every pet like costumes, a few of the pooches just wore pretty bandanas & joined in the fun! Awwww, how cute are all these pictures!! I always want to take Buster to a dog parade, but I feel as though he'd get very overwhelmed. Oh! and that one costume (that you thought was a Transformer) is from the latest Star Wars movie (I only know this because my bf dragged me). I think it's called a BB-8 or something?? BOL!! Thanks for clearing up that Star Wars costume for me, I had no clue! A dog parade is a big deal for many dogs, there was one who had to leave because he just wouldn't stop barking so his owners left. I think baby steps is good, leading up to something like a parade or other event. I hope Buster gets to participate in one someday. What a fun event indeed! I wish we had a doggy costume parade near us! It's so much fun, and I just love that they actually stopped traffic on the road for it! Kudos to them for doing that. We don't have that many dog friendly events here but I scour around & find them! How fun! I also love dog events, it's a day of non stop smiling. It totally is a day of non stop smiling! I love events like these. I LOVE this! Great that your town did this for pets and pet owners! So impressed! Love seeing all the pretty pups dressed up! What fun! I'm very impressed too, not many of these kinds of events here on Long Island. This one and the Fall Festival I blogged about recently were two great ones. This looks like so much fun! And the costumes were all so cute. 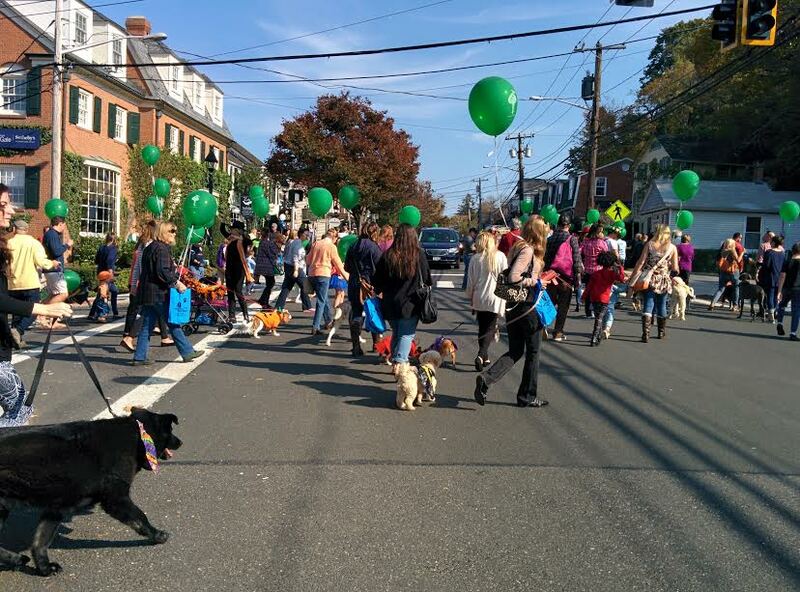 I've never been to a parade with my dog, but I really would enjoy it. We loved it, such a great thing to do for dogs & their owners. It's great for dogs to attend, although they should work up to larger events slowly. So fun! We went to a similar one here in Toronto. I love all the costumes. I love all the dogs in costumes too, it's super fun! This is a great idea. 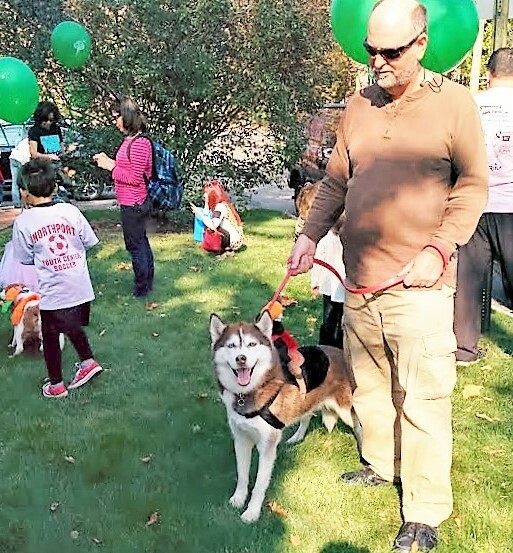 I'm thinking it might be a good fundraiser for a local organization - kinda of step up the 'walk-a-thon' theme and make it also fun for people without dogs. OMD, such a great fundraiser idea!! It's definitely a step up from a walk a thon, something a bit different and tons of festive fun. Maybe a Santa Paws theme where the dogs dress up for the holidays? Mr. N has been to parades but not participated in one. Maybe next year. He'd be such a hit! Maybe you can find one this holiday season in your area. What a great parade! You are so lucky to have such a nice community. It's not all that dog friendly here on Long Island NY but I do scour local events to find them! It's was great fun! It is a good fund raiser idea. Icy says thanks for the compliment! Me too! Aww, Piper must have looked adorable in her tutu! 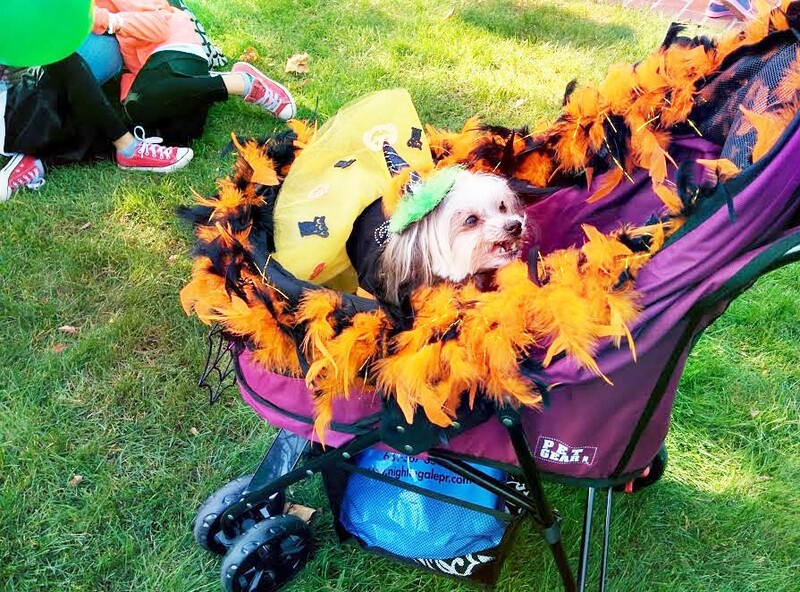 I agree, I'd rather see pooches in costumes parading any day! It really is special. That looks like a lot of fun! I love seeing dogs who are comfortable in their costumes. You had great weather for it too! It was such fun! I love seeing dogs in costumes as long as they're comfy in them. If not, a fun bandana is always adorable too. How cool they closed Main Street for the parade of the dogs in their costumes. I know right!? I was so pleasantly surprised. The drivers that had to line up & wait for the whole thing to be over were probably not so happy, LOL! Yes, it was so great! I'm so glad you enjoyed the photos, thank you. Dog parades are the best, and costumes make it extra special. 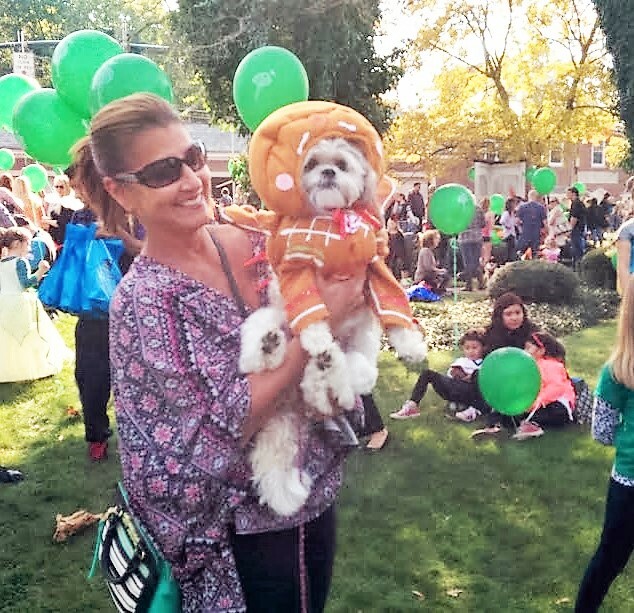 I loved seeing all the doggies in costume. Some of the owners got dressed up too which was so cute. It was so fun. I'm really enjoying the weather & foliage in the Northeast, we just moved back here from Phoenix! I love seeing all these creative costumes! 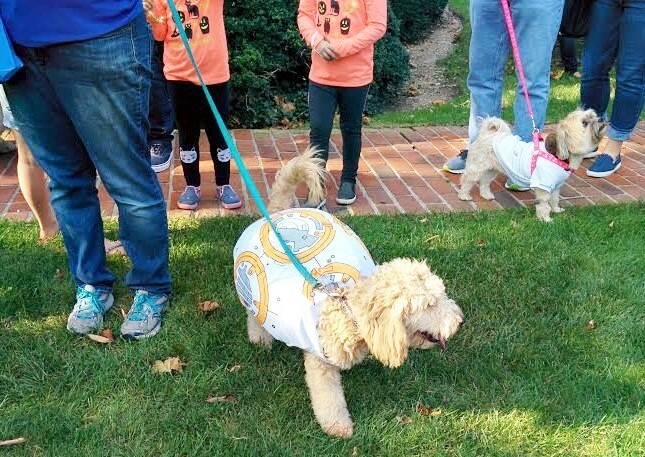 Pet parades are so much fun. Haley would especially love all those green, helium balloons! Good times! Black and White Sunday blog hop!